Going for gold we chose to spend the night in Hermanus so that we could be fresh for our early start the next morning. As we were having our breakfast at the Misty Waves Hotel our Land Rover for the day arrived and it was no ordinary Land Rover but it was a top of the range, Discovery 4 SDV6 HSE loaded with a cooler box of drinks and snacks – let the fun begin. 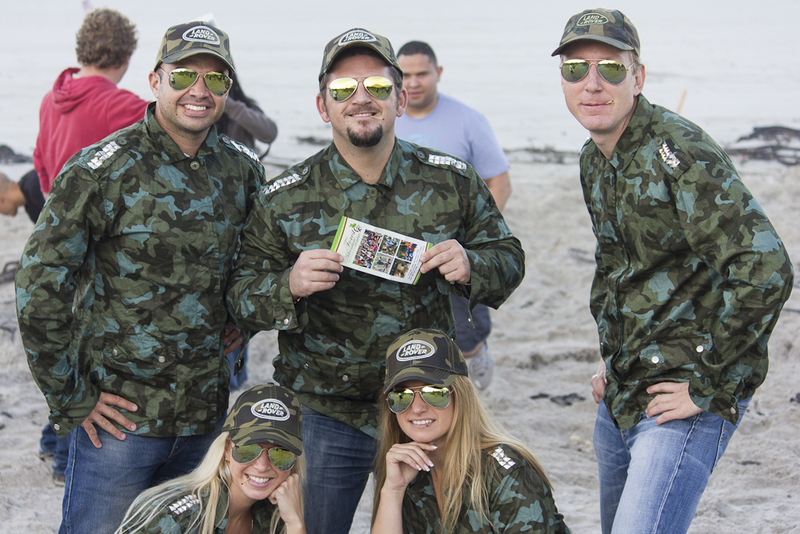 We got so caught up in the excitement and the adrenalin rush as we got our first clue in Stanford and racing to the first shooting and archery challenge at a nearby brewery that it was only after the second station, where we had to search for a map in the sand on Grotto beach that we paused for a group photo. Thinking we knew where we were going we sped towards the forests behind Hermanus before realising we had misread the clue. A handbrake turn and back into town we went, putting the Land Rover through its paces on the gravel road, suffice to say I don’t think we lost any time. Finding our next clue at the Hermanus Railway station, that actually doesn’t have a railway line going to or from it, it was on to the old harbour to find the Whale Crier, who was sneakily dressed in ordinary clothes, and then nominating a team member to zip line across the harbour. Taryn showing perfect form got our next clue at the bottom and after identifying a shark species Dwain drew the short straw and had to wade into the chilly waters of the harbour to retrieve a clue from an anchored raft. This time the clue did require us to make our way into the forest and thanks to our detour earlier we knew the way. 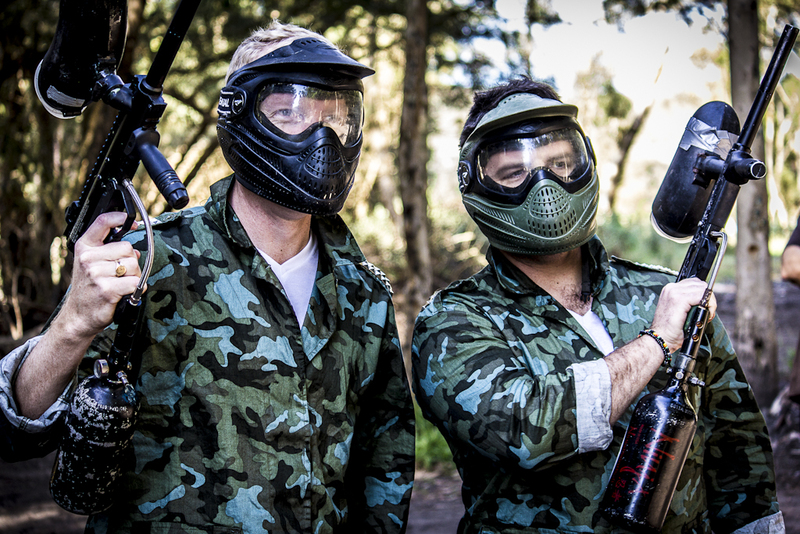 Here Guy and myself were given masks, paint ball guns and sent into the forest to find a shoot a bad guy although we had just 20 pellets. Next came the ‘blob’ which is an inflated blob (for lack of a better word) that one person clambers to the end of while 2 others jump from a platform onto the opposite end. The result is the first person being launched into the air and by all accounts we managed to launch our team mate Sam higher and further than anyone one else on the day and this photo is proof! I then got a chance to drive and what an experience. The Land Rover rep who was our chaperone for the day explained some of the features of the vehicle and you’d be hard pressed to find a smoother ride. Even fully loaded it accelerated as if it was only fuelled for a qualifying lap at Monaco. 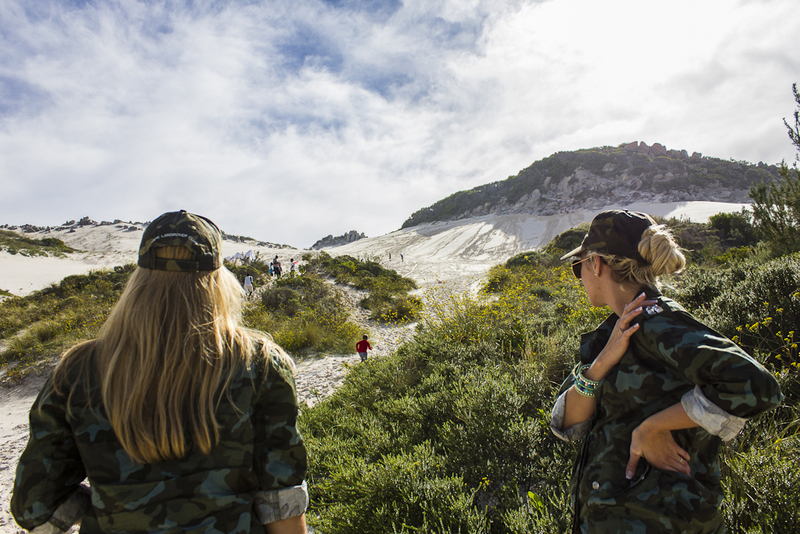 In no time we had found a large penguin in Kleinmond with our next clue and made our way to the nearby dunes for some sand boarding fun, it was a daunting climb to the top though in the soft sand. With half the dune in our pockets after tumbling, rather than surfing, to the bottom it was back on the road to an old water mill in Bot River and then on to the finish line at Caledon Hotel & Casino where we took the chance to do the 9 platform zip line course that SA Forest Adventures runs on the grounds while we waited for the prize-giving. While we didn’t win we stayed in uniform (as you have seen in the photos) through all of the challenges, never breaking protocol and so if there had been a most cohesive team prize we would have won it. Thank you to Team McGUYvers for one of the most awesome experiences so far this year. This entry was posted on June 1, 2013 by Rory Alexander Photography. It was filed under Travel and was tagged with activities, adventure, car, cars, challenge, Discovery 4, friends, GoodHope FM, Hermanus, Land Rover, outdoors, photos, SA Forest Adventures, South Africa, sport, transportation. It was so much fun and they are planning to do it again so keep an eye out for it.